The shine of fine silver can be yours with this charming sterling silver pendant set. The Sterling Silver Oval Color Photo Pendant features a fine cut edge designs that bring a splash of style and flare to anyone's look or style. The pendant works great for all looks and styles and is perfect for everyday wear. 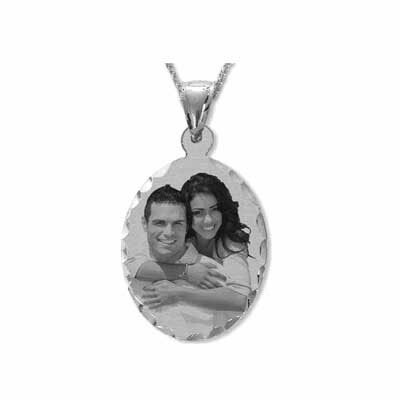 Select a color photo and have it featured in this pendant to show everyone who or what is nearest and dearest to your heart. Give it as a gift for a special occasion or to commemorate a special event in someone's life. There is no better choice than the Sterling Silver Oval Color Photo Pendant for anyone's jewelry collection. We guarantee our Black and White Sterling Silver Oval Photo Necklace with Diamond-Cut Edges to be high quality, authentic jewelry, as described above.